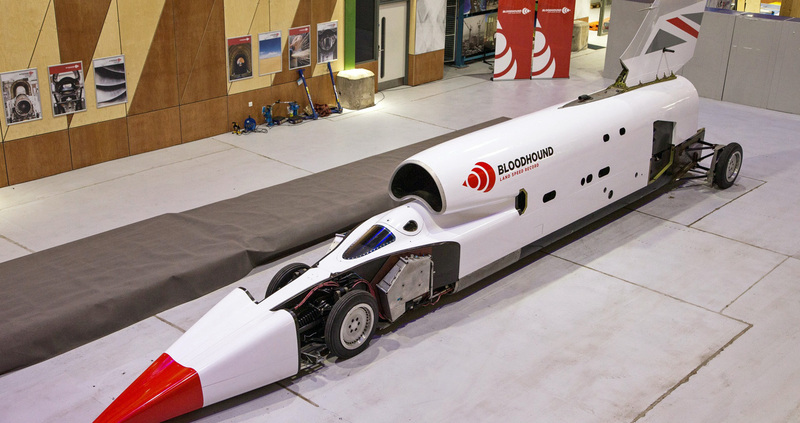 At today’s opening of the project’s new headquarters at SGS Berkeley Green, the Bloodhound Land Speed Record (LSR) team announced they are firmly back on the trail of a world land speed record. Under the new ownership of Ian Warhurst, CEO of Grafton LSR Ltd, the freshly assembled Bloodhound LSR team will focus on completing development of the jet- and rocket-powered car and moving to the next phase of the programme – high speed testing – as soon as possible. The new name, Bloodhound LSR, accompanies a complete rebranding of the programme. This includes a visual transformation of the car, which was revealed in a new striking red and white livery as it moves into its new home at SGS Berkeley Green University Technical College (UTC) on the Gloucestershire Science and Technology Park, designed by Hewitt Studios LLP. More information on the announcement can be found on the BBC Science, Sunday Times and Engineer websites.